Raisin Shortbreads have been in my head for months, ever since I saw a recipe in Alice Waters' Chez Panisse Fruit Cookbook. 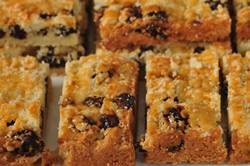 The thought of soft and chewy dark raisins in a tender and crumbly shortbread sounded too good to pass by. So I bought a good quality butter and some Thompson raisins and made Raisin Shortbreads. And they taste even better than they sound. They go perfectly with a hot cup of tea or coffee and I also think they would be a nice addition to your Christmas baking. I know I have said this more than once, but I think it bears repeating. The quality of your shortbread is dependent on the quality of your ingredients, especially the butter. Therefore, buy the best butter (salted or unsalted) you can find and you will be rewarded with a crispy, crumbly, and buttery shortbread that literally melts in your mouth. Another important ingredient is vanilla extract. Make sure that what you buy is labeled "pure". Stay away from the ones labeled "imitation" vanilla extracts as they are made with synthetic vanilla and leave a bitter aftertaste. Now, what type of raisins should we use? I like to use dark raisins in these cookies but you could also use golden raisins. Both dark and golden raisins are simply dried Thompson seedless grapes. The difference is that dark raisins are sun dried which gives them that dark shriveled appearance, whereas golden raisins are treated with sulfur dioxide first to prevent them from turning dark and then air dried to keep them a golden yellow color. Raisins, like dates, have a high sugar content, and are a good source of vitamins and iron. Raisin Shortbreads: Preheat your oven to 350 degrees F (180 degrees C). Butter a 9 x 13 inch (23 x 33 cm) baking pan. In the bowl of your electric mixer (or with a hand mixer), beat the butter until smooth and creamy (about one minute). Add the sugar and vanilla extract and beat until well combined. In a separate bowl whisk the flour with the salt and then add the flour mixture, along with the raisins, to the butter mixture and beat until the dough just starts to come together. Transfer the batter to your pan and gently press the dough, with your fingertips or the back of a spoon, to form an even layer. Take the lightly beaten egg and, using a pastry brush, brush the top of the shortbread with the egg wash. Then, with the tines of a fork, slowly drag the fork back and forth across the shortbread to make a decorative pattern. Bake the shortbread for about 30 - 40 minutes or until light golden brown (the longer you bake the shortbread the more crisp and crunchy they will be). Remove from oven and place on a wire rack to cool slightly. Then cut the shortbread into rectangular bars.